Navigating the Immigration Process: How Immigration Works In The U.S.
America has long been referred to as the “Land of Opportunity,” and that reputation holds true today. Immigrating to the U.S. can provide freedom from religious or cultural persecution in one’s home country even as it opens up additional avenues for education, better jobs, and so much more. Of course, that does make the U.S. more appealing to people all over the world and, because of this, the American immigration process can be difficult to navigate. 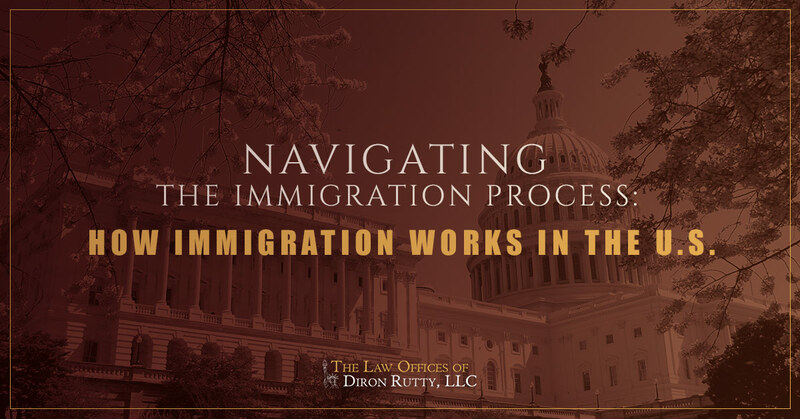 The Law Office of Diron Rutty, LLC specializes in immigration law, and we can help those in The Bronx or across New York City with the immigration process. Start with these basic steps toward immigration, then contact us for personalized assistance. Step 1: Know your needs before applying. Coming to America can be broken down into three main reasons: a temporary visit, to join family, for business/education, or for humanitarian reasons. The reason you are coming to the U.S. will affect the immigration process, specifically whether you will want to apply for a visa, a permanent resident card, or possibly naturalization. Most of the time, applying for a visa is the first step toward staying in the country legally and permanently. Step 2: Find a sponsor, if possible. It can be difficult to get a visa without some kind of connection in the U.S. If you have a family member who is a citizen or a permanent resident, they can help the process. Similarly, skilled workers with a job in the U.S. can apply for a temporary work visa or permanent residency depending on the job and the company’s willingness to sponsor you. Having a sponsor in the U.S. can help the process, but will depend on how close the connection is. Step 3: Determine which visa is right for you. Choosing the right visa to apply for can minimize the risk that it will be delayed or denied. Visas are broken down into a variety of different purposes like tourism, academics, employment, asylum, and family — and will vary depending on whether you seek permanent residency or not. There are a wide range of different visa and permanent resident options, so it can be helpful to work with an immigration attorney or other immigration services to find the right option. After all, the most appropriate visa option for you may not be right for your spouse or child. Step 4: Apply for the appropriate visa. The application for each visa will need to be filled out carefully and, generally, in English. Working with immigration help can ensure that each application is completed thoroughly and correctly. An immigration lawyer can help you determine the right visa, apply, and appeal the decision in the event a visa is denied. The immigration process can be overwhelming and full of obstacles. Do not let the hurdles keep you from seeking the opportunities America has to offer. Find support throughout the U.S. immigration process with the Law Office of Diron Rutty, LLC. Contact us today to schedule your consultation.